During your stay at Graduate House, consider joining the Resident Member Committee (RMC). You can be a part of advancing the feeling of collegiality and being a voice for the Resident Members at Graduate House. The Resident Member Committee (RMC) meets regularly to discuss residency matters, compiles reports for use by staff and the Council committees, and receives and distributes communications to all Resident Members. 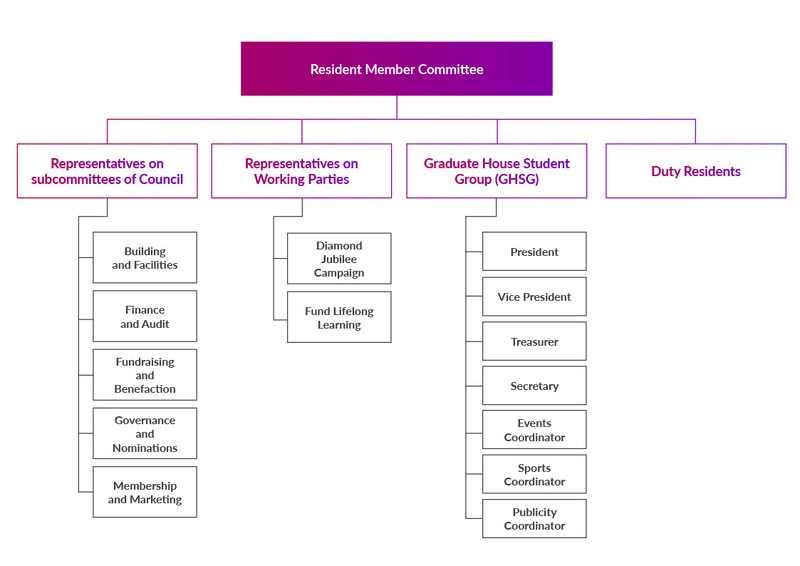 The RMC comprises the Resident Member representatives on Council committees and subcommittees, the Duty Residents and representatives from the Graduate House Student Group (GHSG). Meeting dates are shown in the annual calendar, with the first of four scheduled for late-January each year. To view the Resident Member Committee of 2019, click here. The Graduate House Student Group (GHSG) began in 2014 and is a constituted affiliated member of the Graduate Student Association of The University of Melbourne (GSA). This affiliation brings benefits to GHSG, including opportunities to network with other post-graduate student groups, to apply for funding, to provide representation of postgraduate matters and to gain training. The GHSG is a vital component of our overall house and membership and is convened by the Resident Members for the Resident Members, primarily to organise social activities for the Resident Members. The GHSG committee is composed of Resident Members in positions that include a President, Vice-President, Secretary, Treasurer, Events Coordinator, Environment and Social Justice Coordinator, Sports Coordinator, Publicity Coordinator and Annual Ball Coordinator. The committee welcomes your input and many projects to which you could contribute. The GHSG committee has a succession process to ensure its continuation with the ever-changing population of Graduate House. If you are interested in becoming a committee member or in giving your support for other college initiatives, get in touch. Details are in the newsletter and on in-house flyers. To view the GHSG constitution, click here. Resident Members on working parties, will assist in providing feedback and suggestions for our Diamond Jubilee Campaign and Crowdfunding platform — Fund Lifelong Learning. Duty Residents are also Resident Members who assist others living in the college during non-core business hours (from 7:00pm to 7:30am Monday to Friday and all day Saturday and Sunday). New residents who arrive in the evenings or on weekends are shown to their rooms and given a brief tour of the facility by the Duty Resident rostered on at that time. Duty Residents aim also to make all residents feel welcomed and included in college life. The Duty Resident roster rotates weekly. The roster is shown on the notice board to the left of Reception. The rostered Duty Resident may be contacted by mobile phone, by pressing the external intercoms and from the wall phone at reception (the M3 button). Being on the Resident Member Committee gives Resident Members many opportunities to develop their management and decision-making skills, increase their networks as well as helping fellow Resident Members improve their stay at Graduate House.